Once again I'm indebted to Kazu from Waterslide for showing me yet another great band that I probably wouldn't have come across on my own. I've felt this way for twenty plus years, but it's become more and more obvious every day that as far as music (and professional wrestling) goes, my heart is in Japan. I just wish I could be there more going to see great bands like this play and shop for more records. Also, the G1 Climax is going on right now so pretty much the best pro wrestling of the year is currently happening. But alas, I'm far too poor for another trip to Japan at the moment, so I'll have to let albums like this help me get by. Fastkiss has turned in nine songs of upbeat, 90s style pop punk and I love it. It's not gruff and fast like a lot of the other Japanese bands that I tend to enjoy. Instead, they have more in common with bands like The Hum Hums who seem to be inspired by the more pop focused side of the Beach Boys. There's just great melodies on this album from start to finish, with each song fueled by punchy guitar chords and complimented by excellent backing vocals and harmonies. 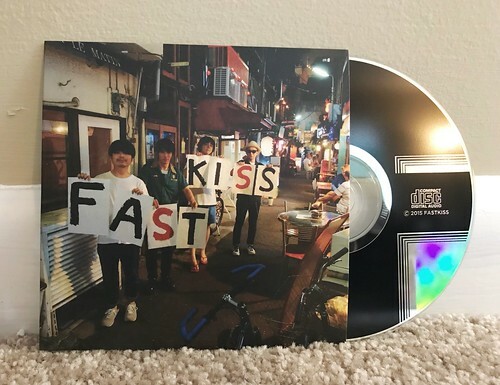 Some of the songs are sung in English and others are in Japanese, but no matter what language the song is in, Fastkiss put their all into each and come out with endlessly catchy tracks. This one might be kind of below the radar, but it's definitely worth checking out.